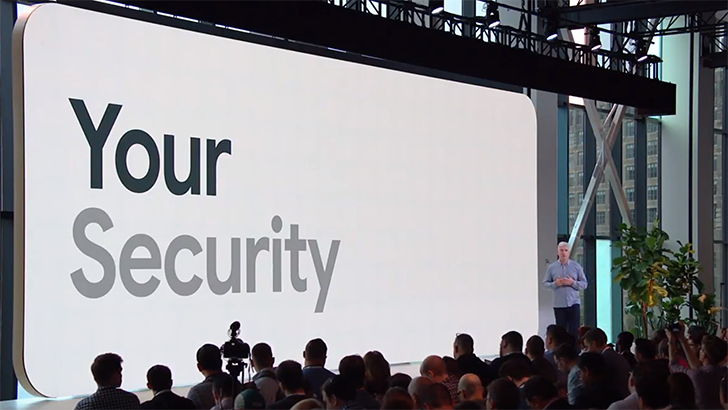 Following a day of bad press regarding an undisclosed security vulnerability, Google pushed the message of strong security during its October 9th hardware reveal event. Among the announcements: the Mountain View-based tech giant has developed a dedicated chip for its mobile devices that integrates Titan Security, the system it built for Google data centers. The Titan Security chip, called Titan M, is integrated into the Pixel 3's secure boot process, and is used to secure the lockscreen, strengthen disk encryption, and protect the integrity of the operating system. "By combining Titan Security both in the data center and on device, we've created a closed loop for your data across the Google ecosystem," said senior vice-president of hardware Rick Osterloh during the event. However, Osterloh's statement that Google is "committed to the security of users" didn't ring true for a few Twitter users, one calling the declaration "ironic" in the face of the security flaw revealed yesterday that unceremoniously shut down Google+ for good. Putting the gentle ribbing aside, though — custom hardware for the new Pixel is always exciting, especially since we've seen almost everything else in leaks. So far, however, Google has revealed very little about the dedicated chip. On the Pixel 3 product page, a link directs users to a help page for Pixel security settings. This is not the first dedicated hardware security module. The Google Pixel 2 debuted with a module that reinforces the lock screen against malware and hardware attacks.